Lithuania unveils the Lost Shtetl Museum, dedicated to the small Jewish communities wiped out during the Holocaust. 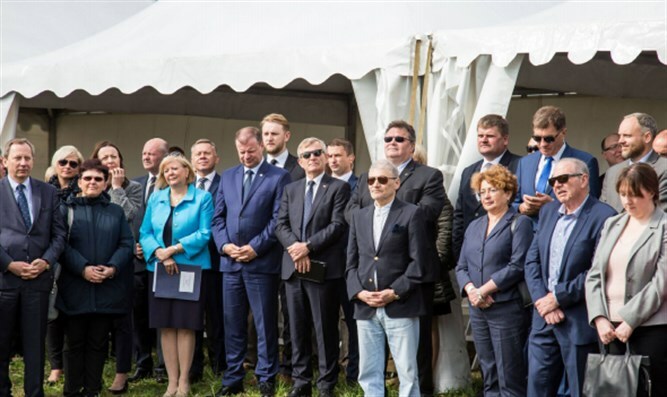 Earlier this month,On May 4, 2018 the ground-breaking ceremony for The Lost Shtetl Museum and Memorial Complex took place in central Lithuania, in Seduva. The project was led by professor Rainer Mahlamäki and Lahdelma & Mahlamäki Architects, Finland. Professor Mahlamäki attended the ceremony, as well as Dr. Inna Rogatchi, the author of the forthcoming film and book on Rainer Mahlamäki’s projects of memorial architecture. The ceremony was attended by the entire leadership of Lithuania and a large group of the diplomatic corps. The President of Lithuania Dalia Grybauskaite had sent a meaningful letter to the ceremony; which was read by the president’s special adviser. The Speaker of the Seimas Viktoras Pranckietis, the Prime Minister Saulius Skvernelis, and the Minister for Foreign Affairs of Lithuania Linus Linkevicius all addressed the public with personal, honest and engaging speeches. The Speaker of the Seimas Viktoras Prancketis told that he and his family are from Seduva, and conveyed a moving story of the personal letter from the famous American artist Samuel Bak who is a child survivor of the Vilna ghetto, to Mr. Pranckietis’ father. It that letter of pain and fervor, the artist wrote of his compassion for his people annihilated in the Holocaust, to be remembered. The Prime-Minister of Lithuania Saulius Skvernelis began his address with an official apology for the role of the Lithuanian perpetrators of the Holocaust, and his both official and personal conviction that today the subject has to be dealt with clarity and honesty. The Foreign Minister of Lithuania Linus Linkievicius emphasized that no commemoration is able to erase the calamity of the trauma of the Holocaust in Lithuania, to recuperate that terrible loss caused intentionally and criminally. Director of the Lithuanian State Gaon Jewish Museum Markas Zingeris also addressed the opening ceremony, and discussed the eternal trauma suffered by the Yiddish world due to the catastrophic losses caused by Holocaust - and utter necessity for the museums like The Lost Shtetl to be constructed and starting to function, not for Lithuania only, but for Europe and the world. The diplomatic corps had considerable representation at the ceremony. Their solidarity, respect and support came to show the Ambassadors of Finland, United States, United Kingdom, France, Germany, Sweden, Ireland, Russia, Armenia, and of many other countries, completing a team of 15 Ambassadors from all around the world. On behalf of their countries, the Ambassadors of the USA and Finland had addressed the public. Anne Hall, the US Ambassador, spoke on the necessity of restoration of memory in both the national and international context. Finnish Ambassador Christer Michelsson delivered his elegant speech as a proud compatriot of the author of the museum’s design, prominent Finnish architect professor Rainer Mahlamäki. The special address of famous Lithuanian film director Saulius Berzinis was an emotional peak of the ceremony. The famous movie director and the founder and director of the Independent Holocaust Research Archive in Lithuania has donated to the future museum one of his most treasured belongings, his inheritance as he put it: the original LP vinyl record of the well-known cantor Mordechai Herschman. That record produced in late 1920s-early 1930s in France had been a favorite treasure of a talented Jewish boy who dreamed to become a cantor and who had listened to the record numerous times during his short life. The boy and his entire family perished in the Vilna ghetto. After the end of the official part of the ceremony, the leadership of Lithuania, the Ambassadors and many participants came to visit the Jewish cemetery, situated nearby and recently restored by the Seduva Jewish Memorial Fund, the same organization that runs the project for The Lost Shtetl Museum and Memorial Complex. The Museum is slated to open to the public in the summer of 2020.